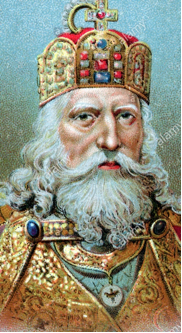 Charlemagne is thought to have been born April 2, 742 AD at Ingelheim, Rheinhessen, Hessen-Darmstadt, Prussia. He is called Charlemagne, Charles the Great, due to his great height. He was King of the Franks and Emperor of the Holy Roman Empire. He lived till 814 AD. Charlemagne is the 38th great grandfather of U. S. President Franklin Delano Roosevelt, my half eighth cousin. Roosevelt is the 18th cousin, four times removed to my son-in-law, Steven O. Westmoreland. Charlemagne is the 11th great grandfather of Edward Southworth, the first husband of Alice Carpenter, my seven times great grandmother through her second marriage, which was to Governor William Bradford. Edward Southworth also is my 25th cousin, eight times removed. Charlemagne is the 34th great grandfather of President John Quincy Adams, my 31st cousin, twice removed. Our ancestors in common are Ragnvald I (died in 890 AD) and his wife, Hild, who were the 28th great grandparents to John Quincy Adams. In addition, King Charlemagne is the 41st great grandfather of Steven Otis Westmoreland, the dashing young man who married our daughter, Tiffany Lenn Sharpe! This co-mingling of families made our daughter a thirty-fourth cousin, four times removed from her husband prior to their marriage. Another family tie is that Charlemagne shares the same birthday as my wife, Suzanne Margaret Boggess Sharpe. However, Charlemagne is the 38th great grandfather of our sons, Taylor Marcus Sharpe & Todd Wittman Sharpe, as well as our previously mentioned daughter, Tiffany Lenn Shape. Looking at the charts in that way, Tiffany is the 38th cousin, 4 times removed from her husband, Steve O. Westmoreland. Charlemagne (Charles the Great) was born on April 2, 742 in Northern Europe. "By the sword and the cross," he became master of Western Europe. Through his enlightened leadership, the roots of learning and order were restored to Medieval Europe. In 768, when Charlemagne was 26, he and his brother Carloman inherited the kingdom of the Franks. In 771 Carloman died, and Charlemagne became sole ruler of the kingdom. At that time, the Franks were falling back into barbarian ways, neglecting their education and religion. The Saxons of northern Europe were still pagans. In the south, the Roman Catholic church was asserting its power to recover land confiscated by the Lombard kingdom of Italy. Europe was in turmoil. On Christmas Day in 800, while Charlemagne knelt in prayer in Saint Peter's Cathedral in Rome, Pope Leo III placed a golden crown on the bowed head of the king. Charlemagne is said to have been surprised by the coronation, declaring that he would not have come into the church had he known the pope's plan. However, some historians say the pope would not have dared to act without Charlemagne's knowledge. Durant, Will. "King Charlemagne", History of Civilization Vol III, The Age of Faith. Electronic version in the Knighthood, Tournaments & Chivalry Resource Library, Ed. 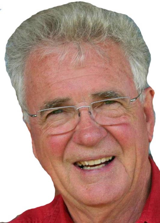 Brian R. Price. 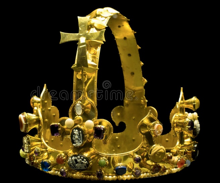 Here is a replica of the crown Charlemagne was said to have worn.